Samuel Devons was Professor Emeritus of Physics at Columbia University (1960-2006). Other institutional affiliations included the University of Manchester and Imperial College London. In addition to research into nuclear physics, the properties of nuclei, and gamma ray emission, Devons was a science historian. September 30, 1914Birth, Bangor (Wales). 1935Obtained BA, Cambridge University, Cambridge (England). 1939Obtained MA and PhD in Physics, Cambridge University, Cambridge (England). 1939 – 1945Science Officer, Ministry of Supply, United Kingdom. 1946 – 1949Fellow and Director of Studies, Trinity College, Cambridge University. 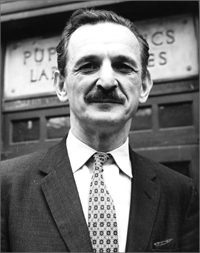 1950 – 1955Professor of Physics, Imperial College London, London (England). 1955 – 1960Langworthy Professor (1955-1960) and Director, Physics Laboratories (1955-1960), University of Manchester, Manchester (England). 1959 – 2006Visiting Professor (1959-1960); Professor of Physics (1960-1984); Chair, Department of Physics (1963-1967); and Professor Emeritus (1985-2006), Columbia University, New York (N.Y.). 1967 – 1968Visiting Professor, Andhra University, India. 1969 – 1984Visiting Professor, Barnard College. 1970Awarded Rutherford Medal, Institute of Physics. 1973 – 1974Racah Visiting Professor, Hebrew University. December 6, 2006Death, New York (N.Y.). Visiting Professor; Professor of Physics; Chair of Department; and Professor Emeritus. Great Britain. Ministry of Supply. London Office. Fellow and Director of Studies. Langworthy Professor and Director, Physics Laboratories. Obtained BA, MA, and PhD in 1939 in Physics. American Association of Physics Teachers symposium: [sound recording]: history in the teaching of physics / 1973 October 12, 13. Oral History interview with Robert V. Pound, 2003 May 22 and 23. Biology and the physical sciences. Edited by Samuel Devons. Excited states of nuclei / by S. Devons. High-energy physics and nuclear structure : proceedings / edited by Samuel Devons. Samuel Devons Physics Today obituary.